Courtesy of China RenaissanceChina Renaissance CEO and founder Fan Bao. 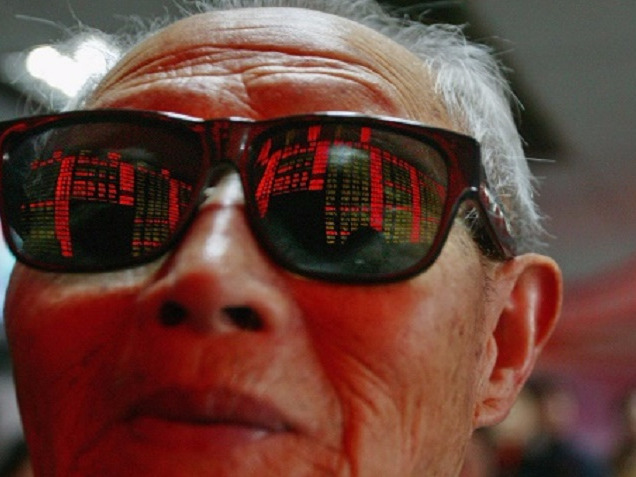 China is the single biggest story in investment banking right now. 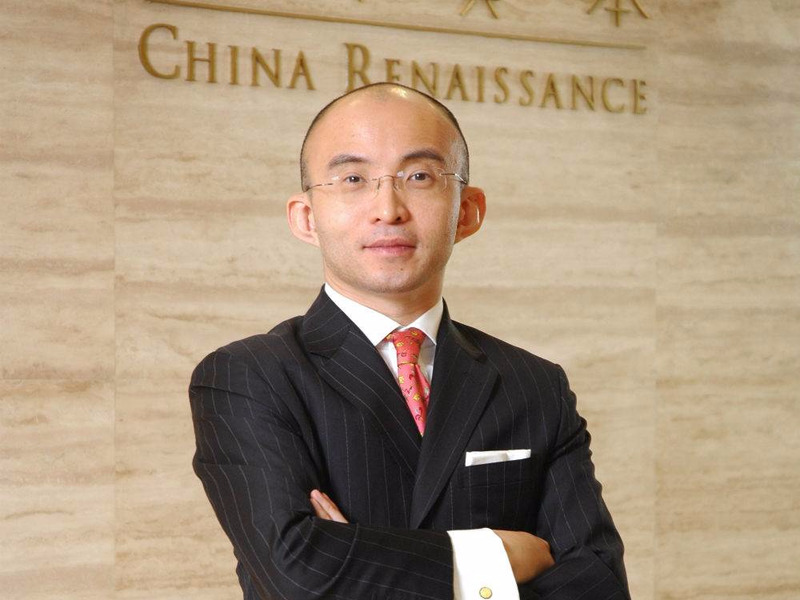 China Renaissance CEO and founder Fan Bao is already at the heart of this story. His recent accomplishments include the $1.78 billion US-listing of JD.com, the $286 million IPO of the microblogging app Weibo, and single-handedly pulling off the merger of the ridehailing rivals Didi Dache and Kuaidi Dache. After seven years in banking and a short stint with a Beijing-based startup, Bao founded China Renaissance in 2004 to advise the flourishing community of Chinese tech entrepreneurs seeking high-quality advice that were too small to attract the attention of bulge-bracket firms. Business Insider caught up with Bao in San Francisco this week while he was in town meeting with the Silicon Valley investing community. He was also speaking at the 2016 Bloomberg Tech Conference. Portia Crowe: Let’s talk about the initial public offering, or IPO, space. The biggest IPO in the US was a Chinese company, Alibaba. But Jack Ma has said he regrets coming to the US. Do you find yourself having to address that with clients? Fan Bao: Did he really mean that, that he regrets that? It’s easy to say that after raising $20 billion here. We just got a licence to operate in China as an issuer — a security firm — so I started dealing with the domestic market a couple of years ago. I find that the two markets are very different. The domestic market is very much retail-driven as of today; 85% of investors are retail investors, whereas here I think it’s probably the other way around. So the markets behave very differently. And also in China all the IPOs are based on the approval process, meaning it’s really up to the CSRC, which is the SEC equivalent in China, to decide whether you’re eligible for an IPO, whereas here it’s more registration-based. So basically anyone can file for an IPO as long as you meet the minimum requirements and there are buyers of your securities — then you can get listed. So those two things make the fundamental difference between these two markets. I think there are pros and cons between these two markets. In the US, when you deal with institutional investors, obviously they drill much deeper. Your business model really has to be approved. And in this market people can buy, people can sell, people can short as well — so inherently the company is a lot more exposed. And, obviously, given that this is an institutional investor market, there are very high requirements in terms of corporate governance because that’s in the end what institutional investors are all about. China is more about — being a listed company, you’re not really subject to that much corporate governance, so to speak. Then again, in China you cannot short a stock, so the stock can only go up; you can’t really push it the other way around. You can sell it and the stock will fall, but it’s not going to fall 50% in a day because they have a 10% circuit break. So in that regard, the market behaves very differently in China. Since they are retail investors, they very much want to bet on the narrative, the big story. You got into a new area, you’re making acquisitions — they’re very much driven by these short-term views. The investors actually give publicly-listed companies a lot of leeway in terms of doing deals, and they like doing deals because that generates a movement in the stock price. But the public companies are not really subject to the same level of scrutiny as the investors here. I’m not making any particular reference to any companies, but I think as a potential IPO candidate, you almost have to decide which system works for you. Crowe: What does Chinese regulatory scrutiny look like? Bao: Given that it’s 85% retail, they have taken a very parental approach to that. So, ‘I have to protect the retail investors’ — whereas the US is all disclosure-based. It’s like, ‘As long as I’ve disclosed I’m a drug addict, you still want to buy my stock, fine.’ But in China, it’s like, ‘No no no. If you’re a drug addict, you can’t do it, because I would not allow you to do it.’ So it’s a totally different approach. Crowe: You have taken a number of Chinese companies public over here in the US. What are some of the challenges you had to overcome in the process? Bao: If you look at the prospectus, oftentimes we’re the only Chinese investment bank in there. So we play a very different role from the other US banks. US banks, you know, they come here, they sell stock. Our clients hire us first and foremost as an IPO adviser — the neutral party in the process, to watch out for the company’s interests. These IPO processes, the moment you start working on it, there’s inherent conflict between the company and the underwriters, right? Because the underwriters want to obviously get the deal done, they want to price the deal low, and often times the buy side pays them a lot of fees on the brokerage side, so they want to give them a good deal. So oftentimes, Chinese clients want somebody on their side to oversee the process, and to help them manage the rest of the underwriters — that’s the role we play. Crowe: How do the underwriters feel about that? Bao: Well, they don’t feel very good about it, but they have no choice. The level of trust is very different, but secondly, and increasingly so, even if it’s a US IPO, a lot of buying interest or investors are coming from China. We have a pretty good distribution with Chinese financial institutions, so we’re hired to also bring the Chinese investors into the IPOs. Those are sort of the two roles that we play in these IPOs. Crowe: Tell me more about the pipeline. What’s exciting to you? Bao: Last year was all about going private. I think there was close to 20 going-private deals last year. So last year seems like the trend is going back to China. But ever since, there’s been a lot of changes on the China side. These privatised companies are finding it harder to access the domestic issue market. The ones that are already privatised are stuck — they have to go through the domestic listing process. But the ones that are actually in the pipeline were originally thinking about a domestic IPO and now are thinking about [a US IPO], because this market, despite all the issues with it, at least is predictable. If you believe in yourself, believe in your ability to market to investors, you can get the deal done. There’s no uncertainty with regard to the approval process. I think that definitely more companies are thinking of coming here. But the pipeline this year is not that strong because of two factors. One I just talked about: Quite a few companies aren’t really decided where to go. Even if they decide to go here, chances are they’re probably not going to make it this year. Most likely next year. But also the cream of the crop of the current generation of Chinese tech companies — they’re not ready to IPO yet. I’m talking about the likes of Didi, the likes of Meituan. I think the earliest they can come out is probably next year, if not the year after next. These are really the best of the current generation Chinese tech companies. Crowe: It’s the Didis, who else? Bao: Meituan. 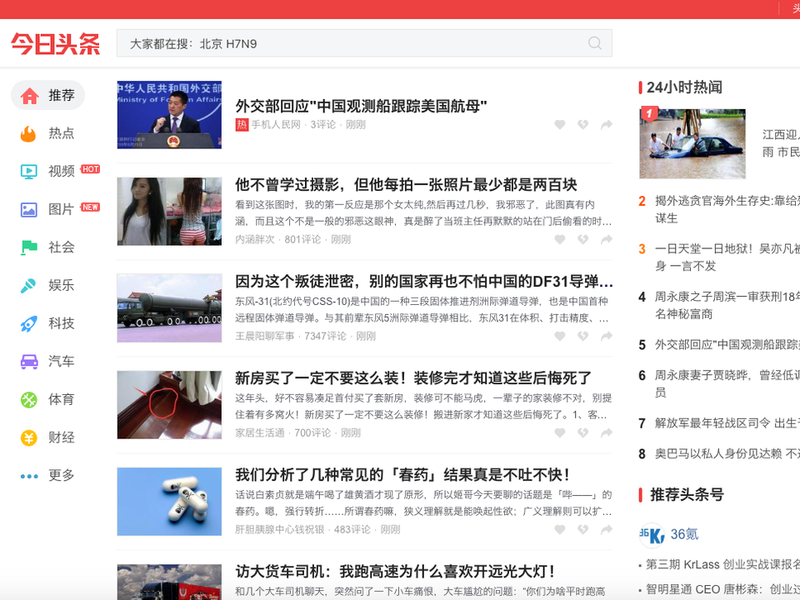 There’s now a company called Toutiao, which is sort of like BuzzFeed, but it’s bigger. Crowe: From which sectors can we expect more IPO activity? 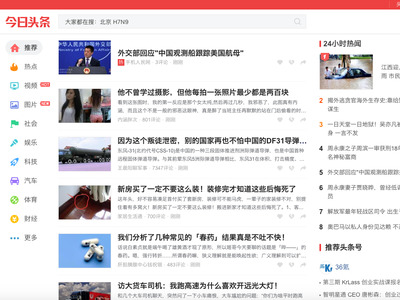 Screenshot/TouTiaoA screenshot of TouTiao’s website. Bao: After last year, it became pretty clear in our view — at least in our advice to our clients — which ones are more suitable here and which ones are more suitable in China. I think the ones that are more platform players — meaning, it’s a platform, it’s asset-light, you have to grow the user base first, then you start to drive the monetisation; at some point there is an inflection point where you really break even and start making a lot of money hopefully. You know, these are the models that are more suitable to this market, because US investors understand. There are a lot of great successes — Facebook, Snapchat, Google, these are all platform players. Investors here are going to buy that story. The more local [Chinese] business model is not exactly platform, it’s more asset-heavy, it’s a model where you may not grow as fast, but it’s a business model where you don’t burn a lot of money; you actually make money as you go. It’s more traditional. Those are the ones — like enterprise businesses, like SaaS, cloud-based businesses, the content business — those are more suitable for the domestic IPOs. Crowe: There are a lot of dire headlines coming out of China right now. People are worried about the transition from manufacturing to services, about potential oversupply in certain industries — do these things impact the tech industry? Bao: The fundamentals are still very strong. The tech guys, I mean, look, the tech companies or New Economy companies, they’re not entirely dependent on GDP growth. A lot of the growth is actually coming from taking market share away from the traditional economy guys. So as long as the base is still small, the penetration is still there, they can still grow very nicely. If anything, a lot of the recent-generation companies are all about making things more efficient, making things cheaper for consumers. So actually when things are not going very well, generally, it’s better for them because they can come up with better solutions. So on that front, we haven’t really seen a lot of the problems in terms of the fundamental businesses. The problem has more to do with the oversupply of capital. Within our industry, there’s definitely a little bit of a bubble — actually a pretty big bubble — being made. Bao: I personally think so. I think there’s a bubble here too, but that’s not for me to have an expert view on. But I think in China there’s definitely a bubble being made. What it means is, valuations are getting unreasonable, and I think a lot of deals that shouldn’t be funded somehow got funded. The market standard has been lowered. We have a lot of issues in terms of retail money going into the venture capital space in the form of wealth management products being distributed by the banks and insurance companies. Those guys are not sophisticated investors. When they do deals, they do not do proper due diligence, they don’t have minimum protections, so there has been a little bit of a race to the bottom so to speak. In a sense, they’re crowding out the institutional investors, because it’s become a game that the institutional investor cannot play. So that’s been an issue. I think a little bit of a shake down of the industry is potentially healthy, because right now things are getting a little frothy. Crowe: Will this lead to a slowdown in IPOs in China, like high valuations in the US have done? Bao: When you look from a capital perspective, our industry is really split in two. There’s the offshore market, which is more moving in tandem with what’s going on here, and there’s the onshore market. The offshore market, the correction already happened, because at the end of the day, the US is still the core market. China is the emerging market, so whenever there is a correction happening here [in the US], the fringe usually gets the most burned. So I think that is already happening. Crowe: So the tech bubble that you’re referring to is more onshore? Bao: It is onshore. The traditional economy is not doing well. A lot of capital is not only not going to the traditional economy, but a lot of the capital from the traditional economy is looking to invest in the New Economy. If you own a factory in China, you stop investing, because your return on your money is negative. You’d rather take your money to invest it elsewhere. Where do you go? You have to go to the New Economy. Bao: Anything on the phone is New Economy. And they’re not doing anything differently. I think Amazon is New Economy — Amazon is selling stuff just like Macy’s was selling stuff, it’s just a different way of selling stuff. You’ve got all these new companies coming up with technology-enabled innovative business models. These are the guys that come out and disrupt the way the traditional economy is being made. Crowe: So in the New Economy, you roll out of bed, you order breakfast on your phone, get in your Didi or Uber and go to work? Bao: You wake up, you look at news on your phone, you go to work, you travel using Airbnb. I think that’s everything that we call the New Economy. I think the good thing about current-generation tech companies is the demand is not created out of thin air — the demand is already there. They just come up with a better, more efficient way to address these demands. Our service industry has never really developed, so our base is very low. So the benefit of that is, when we start building the service industry, we can start with the New Economy to address that. You think of healthcare services in China — it’s upsetting. Hopefully you’ve never been there. The queues are so long, it’s dirty, and everything else. But you know, there’s got to be a better way to provide health care service to the masses. That’s why a lot of new companies are coming up in China that do a lot of pre-diagnosis on the phone so that when you go to the doctor, 80% or 90% of the work is done, so it makes it more efficient. They do all the home care stuff. You can put all sorts of phone-based monitors and the data is fed back to the hospital. Crowe: So healthcare service apps are big? Bao: It’s very popular. I don’t think any one has come out to be a clear winner yet. We’re still looking at a whole bunch of them. Crowe: Let’s talk about the venture capitalists. In addition to underwriting IPOs, you take VC money and help invest it in pre-IPO companies in China. What are VCs interested in right now? What are you hearing from the VC community about China? Bao: Generally people are a little bit lost where the next big things are. We know the areas that are going to be big, but it’s hard to tell who is actually going to emerge as the winner. But there are three things that I think we have agreement on, among all the VCs. In China, what we call the Consumer 2.0 is going to come. By that we mean a new type of consumer. They tend to come from the middle class, they are better-educated, younger. These guys want something different from the previous generations. Previous generations, it’s all about how cheap — you have to be cost-effective. But the younger generation, the current generation, they’re not only comparing prices, they want quality, they want individuality, they care as much about a product itself as the shopping experience, and they don’t respond well to advertising. Oftentimes they buy stuff based on peer reviews. This is going to drive a new wave of consumer companies and the existing pecking order is probably going to change. So that’s one thing. The second thing is, there’s been a lot of critiques about China — the lack of innovation, oftentimes copying US models. I mean, a lot of that is probably not true. But it is true that the underlying technology has not been the biggest differentiator — the differentiator has been the business model, has been the team operating it, has been the operating efficiencies — but not the underlying technology. Among the VCs, there is a consensus that, going forward in terms of looking for the generation of great companies, the emphasis has to be placed on technology. We are actually looking for companies that have at least some level of proprietary differentiator technology. If your innovation is based entirely on the business model, the problem with that is it can be copied overnight, then you end up competing on the basis of resources, competing on the basis of capital — so that’s a pretty bloody game. The third point: Healthcare, healthcare, healthcare. Everybody agrees healthcare is the big thing. From drug discovery, biotech, to med tech, to healthcare services. I think technology will play a very important role on all three fronts. We see this crossover between life science and information technology — I think that sort of intersection is going to create a lot of interesting opportunities. Crowe: You mentioned Didi and Uber earlier, and the competition between the two. Tell me about that dynamic, where you have maybe an original from the US and a similar model from China. How does that play out? Bao: I must say, among all the foreign companies, foreign internet companies, Uber has put up the best fight in China. They’re really hanging tough there. No foreign internet company has ever succeeded in China. They are doing as good a job as they can, so hats off to them. But I think it’s kind of tough to compete with Didi in China, because at the end of the day, it’s a domestic business, there’s a huge domestic market. And the Didi guys are good, I mean, they’re really good, so I think it’s really a tough battle. Everyone asks me, when will they do a deal? I really have no idea. Logic kind of tells you that some sort of partnership makes sense, but we all know the world is not logical. Crowe: Well nobody thought that Didi and Kuaidi would do a deal. Bao: And we put them together. Crowe: So is this your next big challenge? Bao: All I can say is the deal will happen when the founders decide it’s the right time to do it. At the end of the day, the ball is really in their court. Crowe: Tell me what you’re seeing in the outbound mergers-and-acquisitions space. Bao: There is enthusiasm as well as interest on both sides, but there is also a very significant asymmetry of information on both sides. The Chinese, they want to invest in the space here, tech or not tech, but there’s no systematic way for them to source high-quality assets. And also because guys here don’t really know them, usually they do not get the first call — they probably get the last call. But the US side is the same, because you’ve got so many Chinese coming here, telling them, ‘Look I have buying interest, I want to invest in this, I want to buy that.’ They don’t know whether these guys are real or not. So I think we at China Renaissance can play a role, because we’ve actually been operating on these two markets for a while. We really want to be the bridge and we want to be the gateway for Chinese investors looking to acquire assets and invest in deals coming this way as well as the other way around for the US companies who want access to Chinese companies. You need someone in the middle who is credible. nd vice versa, the guys coming here are like, ‘I have located this fantastic deal, it’s the hottest deal on the market,’ and they check with us and we can tell them whether this deal is real, or as hot as they think, or just a deal that nobody wants that somehow they package off and try to sell to the foreign investors. Crowe: The government has placed an emphasis on the tech industry, right? Bao: I’m not sure it is at the behest of the government. The government is promoting the domestic tech industry — they have been very pro this industry as they try to change the structure of the Chinese economy. But I think it’s more down to individual companies. Some are looking for growth, some are looking for interesting technologies, some are looking for attractive assets to buy. So that’s what’s driving it. I understand there has been an influx of Chinese interest in this market, looking for investment and acquisitions, but I think it’s happening more at a micro level. I don’t think the government has been directing buying interests. Crowe: When you’re looking at the next generation of companies, you’re also looking for the next great entrepreneurs. What are you looking for in entrepreneurs? Bao: I think it’s hard to generalize that. But I think the key thing is really matching the demand with the job. Meaning, there’s no perfect man or woman. It’s about this particular individual, whether he is up to the job. So you have to understand what the job entails and you have to understand the individual — so whether there is a match. I’ll give you one example: If you do a social network, the entrepreneur better be young, the same generation as the users, a great product guy, have unique insight into the users and the needs and wants of the users, and really passionate about the stuff he is doing. He’s not just making the product, creating a company, making a little money, but he truly believes his product can help his folks, or her folks, to make things differently. So that’s one. But if you’re an enterprise guy, you’re probably a bit older, and you need to be able to manage a pretty large engineering team. And the thing about enterprise is you have to sell. So the best enterprise entrepreneurs we have seen are more sales-y types, like coming from a selling and marketing perspective as opposed to a product-development perspective. Early stage development is probably all about the entrepreneur, or 90% about the entrepreneur. Even if the idea is somewhat less than perfect, he’ll somehow figure out a way to make it perfect. But the challenging part is this: It’s easy to say, ‘OK, this is what the job entails; does this guy have the right experience?’ But often times he doesn’t. Has he had experience managing 1,000 people? Of course he hasn’t. So how can you tell he actually has the potential to do that? That’s the harder part. The youngest entrepreneur we’re working with is a China Renaissance client who was born in 1995 — a 21-year-old kid. Bao: He came up with this pretty cool app that enables you to do karaoke online and do competitions and do social networking on top of that. Karaoke’s very popular in China.